Now the vehicle physics will get better, waaay better. I am writing this message as I have driven tractor-trailers in Canada. can u guys make a multiplayer its more fun! thats so cool scs! very good help for you and a big wish is coming true for all fans of ETS2. Congratulations for the know-how improvement, and let me welcome Jirka in the SCS trucking games community! I'm sure he will be a valuable addition indeed! Here's hoping that his counseling will have clear impacts on ETS2 as well, not just your subsequent games! This is incredible! It's going to be the Best truck simulator ever! good luck Jirka! superb stuff SCS!!! That is a great news. I think that is wery good idea, that some day you would be able to play a real simulator of truck driving, like you are realy in the truck. It would be great if you coul use all of the buttons on the dash bord not by presing the keyboar buttons but with the mouse klick. Exsample: you should hold the handbreak with the mouse and pull it to engage it, and the ligts and all of that. Obout the trailers, i think that would be great in the game that you would have to buy your own trailer and use it. If you want to drive diferent cargo (gravel) you shold buy another trailer for transport. P.S. : Great work SCS, looking forward on a release. Really great news! I'm so glad you taking it more and more seriously - and I'm convinced this collaboration bring sweet fruit one day. :-) Good luck to you, Jirka, and of course good luck to whole SCS. scs nice piece of work, this will be a great advance booking for your games. and the games will continue Woden realistiser. I'm a fan of the ETS and the German Truck Simulator. I think your games are realistic and very good, but I always miss the last part of reality on the highways. I would like to see coaches, motorbikes and smaller tucks driving there. Furthermore it would be great if you could involve passagers walking along the streets in the cities. At night there should be fewer passagers that at midday. If you could itegrate that ideas I would be restles happy. Well that work is really fantastic and i think that the game step by step will grow. But You are doing a really good work. hope u fix wrong mirrors of the scania too..
maybe about time we get realstic game play like waiting for your trailer to get unloaded ect. the game will be released on January 10? Welcome aboard Jirka. This is goods news because it shows you guys are committed to giving us realism. I always say truck driving is only a small part of the trucking experience. Especially if you own your truck, then the business side consumes your life. There are so many great ways for SCS to expand this game given the great foundation you already have. And Please SCS Fix The cabin height. The cabins in T&T are too low ,so please make it high. Helo SCS, this is a good news. I would love to have an aprosomote release date of the game. Will it come out in the first quater of 2012, the first half or must we wait for this fantastic game until August 2012? Do you have any idea? If you do not tell us that as wel? And for fans, SCS have said that the game will not come out before new year. This is sad, but we wil just have to practice parking in Trucks and Trailers and wait. While i'm into it, is there anyone who have gotten gold on all the tracks at difficoult level? Howdy from Texas!! Thats amazing the fact that yall made all these games without trucking know-how and yall did very good on those games!!! I rekon games are going to be a lot better from yall now ur armed with knowlige!!! If yall make a North American Truck Sim I could help!!!! Do you guys already know when the release date is? I can't wait to play this OVER-nice game!! Now you can work on realism of driving the truck. In previous games, it was aful. This steering and especially the GEARCHANGING AND ACCELERATION?!?!?! Hope those things will be fixed, before the release of ETS2. The game looks fabiolus now. 11 point form 10. Just amazing. But if the realism is same as in your previous games, it would be 2 or 3 point from 10. Fantastic work SCS Software team. Awesome news indeed. Forgot to mention - Welcome to SCS Jirka. Hello Jirka! Please check out the most problematic things here said this means accelerating and braking. Good LUCK!!!! Excellent news! He will help in the important part of making the game more authentic and realistic. With German Truck Simulator you feel in a truck. But can see many imperfections that make the game a game, understand. You know that driving a loaded truck is more than that. We see Mercedes Benz Atego and Volvos VM all the time(here). Behave differently in the game, how rock, go up hills slowly. I really always thought the game should have more than just looks. Now, more than ever, I will gladly drive my Actros, and 6X2. By the way, SCS is doing good job. A really good job this time. I haven't comment on graphics side or any other thing, because SCS has already done these things great. All we want is realistic physics, nothing else. Please, pay more attention to shifting delays. 0-100 on trucks takes time. The main reason is not the horsepower, as many people know the opposite. All trucks today have power, nothing to say about it. But upshifting through 10+ gears takes time. This is the most important thing you should consider. And braking time... Especially, slowing down of the vehicle without braking. In the former editions, fully loaded trucks slowed down as if they were not loaded and they were under braking. That's unrealistic. When I let off the gas, it should keep most of its speed. VERY good news for us! Euro Truck Sim must be realistic. We aren´t childern. We know trucking is a hard job and we want to see it also in Euro truck Simulator. Don´t make game, make the SIMULATOR. ^ But you must understand that they doing it primarily for business. And true simulators are always much less saleable then games. Of course - some things need to be improved, no doubt about that! Optimal would be to make balanced compromise; to develop game which is not "offending" for true simulator fans, but not so hard for casual players. (Believe it or not, casual players are majority of SCS's paying customers.) Of course it's very hard to develop software like that, but it's possible - and I believe with new, professional reinforcement (and Jirka is professional for sure), things will be much easier. This is one of the most wonderful new you have tell us. Now I really think that ETS2 trucks will not run like a small car!!!! Moment! Takze Jirka je testovaci vodic v Scanii a este pritom aj recenzuje hry v GamePage? Som vobec nevedel ze robi v Scanii! Ten sa ma! Excelente contribuição para o game, nada melhor do que alguém que sempre esteve ligado diretamente aos caminhões. Parabéns. Will it has a multiplayer mod ? 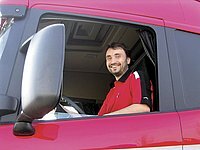 Yeah, With a real truckdriver this can be really interesting, i am one myself here in Sweden, driving one of those crazy 24m long and 60ton trucks here. And the biggest issue in your other games is that a 44ton truck doesnt feel like a 44ton truck. Its more like a very big slower car. 0 up to 45-50km/h doesnt have that much difference if you are fully loaded or not, but 50 up to 90km/h there is a huge difference in empty or loaded. Bug Shield/windscreen stone shields like in Rig'N'Roll and 18wos ET2. I have been searching for a mod for a while and no success. Thanx guys, the best series of games I have ever enjoyed playing, keep it up!